Joel Stamp soaks in the sweet aroma of 100-year-old sap as he enters his happy place — working with his hands in the outdoors while saving the bees. 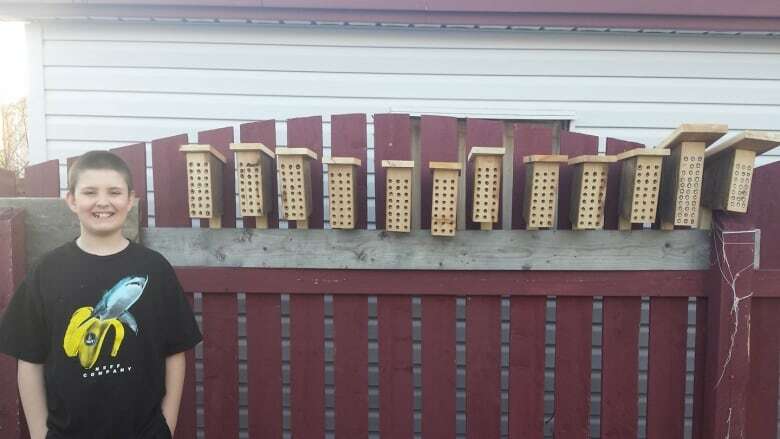 The nine-year-old St. John's boy is a blend of entrepreneur and environmentalist, creating bee condos to sell to customers for $20 a pop. "It keeps them warm and helps them build a nest," the fourth grader at St. Teresa's Elementary explained. "They live inside it and have their babies in there." Joel's mother, Jennifer, got the idea from the Earth Rangers — a conservationist group for kids around the country. Her son had been looking at starting a lemonade stand, but quickly changed his mind and put all his efforts into bees. 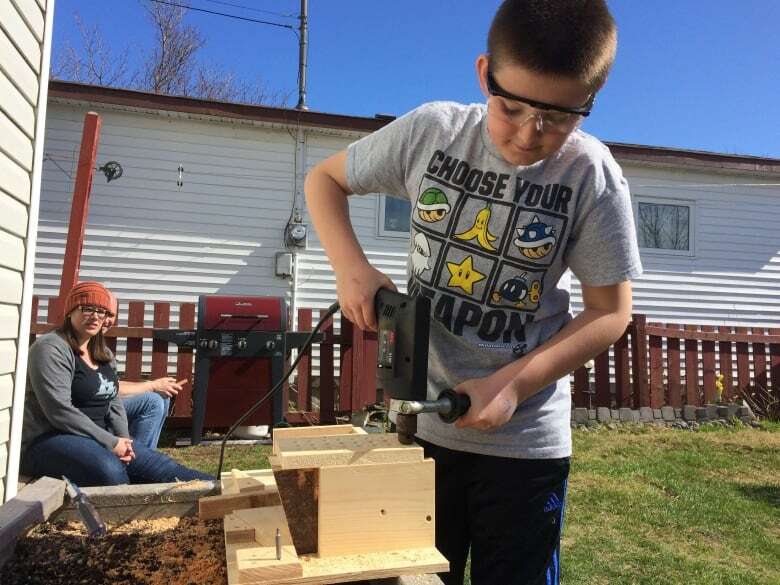 Joel begins by securing an old slab of wood in place and uses his grandfather's drill to make holes. After drilling three rows of eight holes in the wood, he fills them with paper to protect the bees from sap. He then puts a roof on the small structure and another piece of wood with two screw holes to attach it to a surface. "You would put it somewhere where there's nothing busy happening," Joel said. "If it's busy there, then they might sting you and they might bother you." After his mother posted photos of Joel's new project in a Facebook gardening group, the attention started rolling in. "I got a lot of likes and hearts and that stuff," he said with a grin. "And then I said, 'Mom, I think maybe I could sell these.'" Jennifer then made Joel a Facebook page for his business, Joel's Bee Factory, and began taking orders. 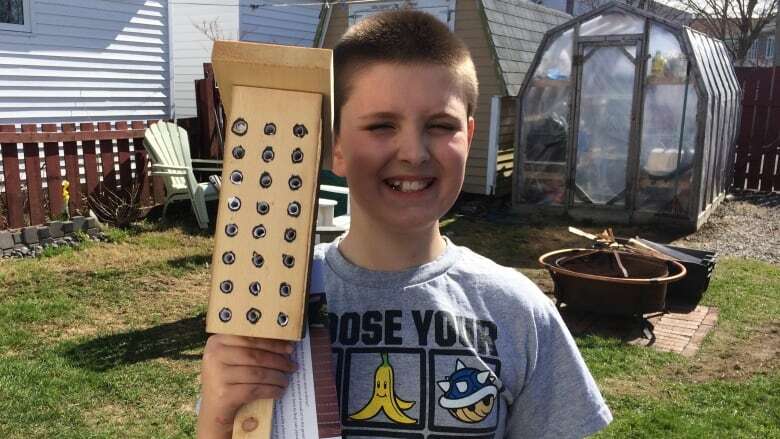 So far, Joel has sold 18 bee condos with $2 from each sale going back to the Earth Rangers. "He actually wanted to donate all the profit he made back to Earth Rangers, which is very noble of him," his mother said. "But I said for your effort, maybe you should keep some money for yourself." After some thought, Joel decided he would save money to pay for a family camping trip instead. While Jennifer will spend her summer "handling the paperwork," as Joel puts it, she could not be happier with her son's initiative. "He's a pretty amazing kid." As for Joel, he'll spend his summer filling orders and becoming friends with the bees. "I've come to like them now and learned more about them," he said. "They're not like wasps or hornets. They're just bees."